Available in a 24" wide, 36" wide, or a 48' wide configuration, with depths from a 10" deck to a 30" deep base shelf. 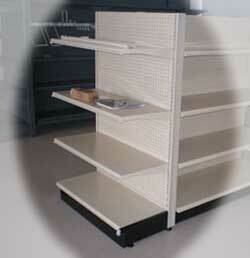 The most popular end cap is configured using a single sided section of shelving in a double back configuration. This configuration can simply be set up against the end of an existing aisle of Gondola Shelves. Also available is what is known as an End Frame. The End Frame mounts on to an existing end of an aisle of Gondolas that utilizes a detached base.